A Tesla Model 3 successfully avoided a frontal collision using the standard safety features such as the ‘front radar’ & ‘Automatic Emergency Braking (AEB)’ — the incident was recorded live with the help of onboard dashcam (video below). Tesla Model 3 owner apparently from Georgia states that he was never going to be able to avoid that crash without the vehicle’s assistance — as we can see in the video that the SUV in front collides within 5 seconds of the Model 3 lane change. A human driver in such a situation might not be able to predict an accident from only looking at the front, Tesla’s radar technology can jump from under the front vehicle to detect a second vehicle in front (How Tesla radar works with AP 2.x). This is what we have seen in this situation, the Tesla Model 3 was fully confident that the vehicles in front are going to crash so the car decided to come to a full stop — let’s watch. According to the Model 3 owner ‘Autopilot’ was not engaged at the time of this accident, but standard Tesla safety features are always active and use the AP 2.0+ hardware (see diagram below) assistance at all times even when the driver is not using ‘Tesla Autopilot‘. 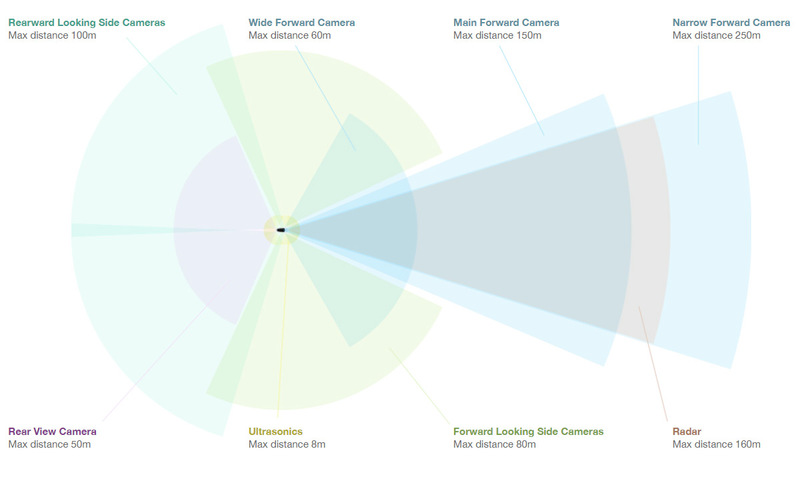 A Tesla hardware 2.0+ vehicle’s front radar has a range of 160 meters which can easily detect a range of objects in front as we saw it in action in the video above. The car started slowing before the car in front of me pressed their brake pedal, as shown by their lack of the over the middle brake indicator. That’s awesome. I no longer am going to complain to the car when it slows down or brakes for some reason I don’t immediately understand. We also have to remember that Tesla Model 3 earned a 5-star safety rating in every category at the NHTSA crash-test platform — not only that but Tesla Model is has the lowest probability of injury when comparing it to any other car that NHTSA has ever tested (learn in-depth). Earlier this year a similar incident happened when a Tesla Model X avoided a side collision from an overtaking semi truck on the highway, in this stance, Tesla Autopilot was engaged vs. the current Tesla Model 3 incident where standard safety features were active only.